Apologies in advance for what will be a long post here, as my “reflection in action” during the conference consisted more of trying to find free wifi and navigating the Riverwalk than it did of actually having time to sit down and think. I tried to break my thinking up by day, for what that’s worth, and hope that these thoughts are useful for all my readers, especially all my colleagues who were unable to attend. That said, NWP/NCTE2008 was a wonderful week of connecting and collaborating with colleagues, and there is so much to think about it is hard to know where to begin. So, I will organize it by day. One thing that I will note here and throughout the rest of this post is that I sensed a definite shift, a change in the tone about how people are talking about newer literacies and technologies. In a sense, it is as if we no longer had to begin every conversation, every presentation with a disclaimer: “let me tell you why I use technology in my teaching of writing.” Instead, the conversations simply began with the premise that we simply are using technology to teach writing. And that is darn cool. Now for a summary of the week. and Christina from NWP brought some clarity to my thinking (something that has been sorely lacking as I have been digging through loads and loads of data). I feel very confident in the work that we did and that the book will be useful for educators in a variety of contexts. I was able to interview someone from Google about the use of Google Docs in education, and that conversation (among the many I have had with NWP colleagues) reminds me that things are definitely changing. Yes, there are still issues of access and the digital divide. Yet, I think that students and teachers are finding more and more opportunities for thinking about how to teach digital writing because the tools are (almost) all online and (almost) all free. Not to go overboard on the idea of the conference theme, but I could finally see the revolution in action over the course of this weekend. Teachers are beginning, across the board, to make the shift. the fact that being digital will be a major part of who we are. A talk with Bud Hunt later in the weekend reaffirmed this belief that our site should intertwine our web presence with our core work, and I look forward to tackling that when I get home. Also, another cool aspect of Thursday was that I was interviewed by Paul and a crew from the Pearson Foundation about how writing is changing in a digital age. They were getting interview with a large number of TCs throughout the annual meeting, and I can’t wait to see how the videos they will be producing turn out. Why is writing important now? As it has always been, writing remains a key mode of communication. It is important today because writers in a variety of personal and professional roles are being asked to produce a greater variety of texts, for a greater variety of audiences.While many teachers — especially those involved with NWP initiatives — continue to build on the principles of good writing instruction, we need to continue our efforts and supporting the teaching and learning of writing in all of our classrooms, K-12, and across content areas. As writers adapt to new situations for composing texts, they need to be adept in a variety of writing skills and genres.We, as educators, are the ones who introduce them to these skills and genres when we keep our attention on teaching writing with intention. Writing in a technological world means what? In an increasingly networked world, writers need to adapt to different purposes, audiences, and contexts for writing that have been enabled by newer technologies. This also involves a shift in how we think about who writers are, how texts are produced, and where texts are distributed. Regardless of how “digital” we think our students are — and, no doubt, most of them are more adept at particular digital skills like using Facebook, Twitter, or text messaging, they do not necessarily come to those tasks with the capacities that make them critical and creative digital writers. Not only do they need to understand the technical aspects of creating hyperlinks, posting to a blog, or collaborating with a wiki, but they need to have the intentional focus as a writer to understand the audience and purpose for which they are writing. Who reads your Facebook updates and why? Can you write to that audience in the same manner as a you can when you produce an academic paper, even if it is posted on a blog? Moreover, they need to consider the ways in which we can compose with multiple modes and media. For instance, one can argue a position through a traditional essay, a 30 second public service announcement (either an audio or video), or in the form of a single-page advertisement with an image and few words, or no words at all. Understanding when, why, and how to use different forms of media to convey a particular message requires a working knowledge of the mode — that is, what does an audience expect in order to be persuaded — and how to effectively manipulate the media. So, writing has always been a complex act, and newer technologies offer writers numerous opportunities to get their message across. Writing in a technological world means that we, as writers and teachers of writing, need to be aware of these choices and how we can best utilize them to have the intended effect on our various audiences. One disappointment… no more Tech Matters. That institute, more than anything else I have done, has shaped my thinking on teaching digital writing. I will miss it dearly, but understand the choice that was made to go to a more site-focused technology retreat. So, while I am sad to know that Tech Matters is no more, I am encouraged by the work that is happening across the NWP network related to digital writing. There are some promising things on the horizon, one of which I hope becomes this book project. Thursday night ended with our traditional RCWP dinner. Janet thanked all of us and praised our new site, but I want to say thank you, Janet, both for dinner and for all that you have done to enable teacher leaders to fill entire tables at an annual meeting, reflecting on a year of shared work. The read/write web has finally delivered the promise of having a real audience and varied purposes that writing teachers have so long looked to bring to their classrooms. From the beginning of the process writing movement, when Emig first looked at the composing process and Sommers identified revision strategies of experienced and novice writers, teacher researchers such as Murray, Graves, Calkins, Atwell, Ray, Fletcher, Portalupi, and others have been trying to invite student writers to see audiences and purposes beyond the classroom and traditional school genres. While this began to occur in the 80s, 90s, and early 2000’s, there was still something “fake” about this writing. Yes, it was shared with peers in class. Yes, it was read at author’s chair or published in a school anthology. Yes, it went home and made it on the fridge. And, if it was lucky, that student writing made it to a local newspaper or other venue for publication. When the internet really hit big at the turn of the 21st century, writing teachers felt as if they could have a purpose and audience beyond the classroom and school. Some were able to publish their writing online, but things got in the way: FTP, limited or no access to the server, passwords, firewalls, as well as the onerous HTML editors. The promise of the web was to democratize information, and it did — if you could figure out how to create web pages and uploaded them. Even discussion forums — with all their ability to post and respond to writing — hit the scene, there was still something impersonal and difficult about “publishing” one’s writing. or have a specified program on his or her computer. We could write (and publish our writing) any time, any where. “networked publics.” We can access our documents any time and any where that has a network connection, including on handheld devices and mobile phones. What this means is that — in addition to being able to write in multiple modalities and media — students must be made aware of the ways in which their writing is distributed and perceived across the many networks in which they participate. What this means for teachers — and NCTE — is that we need to consider the many ways in which students see themselves as writers (and, according to the Pew report sometimes do not see themselves as writers) and invite them to be intentional about how they read and write in a digital age. We have learned a great deal about revision and how audience and purpose can lead to intentional writing. NCTE should continue to support scholarship and professional development that builds on the principles and research findings that we have, noting the ways in which we as teachers can guide “digital natives” who may know how to send a “tweet,” but may not always be thinking about the ways such a message can be interpreted. In short, we need to continue the professional conversations that we have been having about writing and revision over the past three decades, taking what we know about these processes and moving them into the era of the read/write web. NCTE continues to move in the right direction. In just the past year, they have adopted the statement on teaching multimodal literacies, and released two research and policy briefs (one specifically on 21st century literacies and the “Writing Now” brief that encompasses a broader view of the composing process). By offering the summer institute on 21st century literacies, webinars, and the “Tech to Go” sessions at the conference this year, NCTE keeps moving ahead with this work in practical manners. The website redesign and Inbox blog offer good examples of how NCTE is trying to stay in touch with members. Doing that interview really helped me articulate my thinking, and I appreciate the opportunity to have done it. Friday morning brought me to my first presentation with some NWP colleagues, “Revising the Writing Process: New Literacies in the English Classroom.” Paul Allison, Chris Sloan, Aram Kabodian, and Dawn Reed were able to present their work related to blogging, podcasting, digital storytelling, and social networking to a crowd of over 100 (don’t believe me — check out the pictures below!). I won’t go into detail on the session, as we have all our materials on our wiki, but suffice it to say that the work these four shared is both amazing and timely. Participants left with only a tiny handout — a bookmark with our URL on it — but loads and loads of ideas. I think that my friend and Project WRITE colleague Liz Webb recorded the session as a podcast, and I will try to get a link to it. Friday dinner brought together friends and alums from MSU, packing a restaurant. A few of us ended up in the Italian place next door when the tables overflowed. Despite missing the conversation with the large group, it was great to spend time with so many people who have ties to the green and white, even if just for a short while. Saturday brought a meeting with my editor on another book project, on that I will be very excited to return to as the semester comes to a close and hopefully involve some Project WRITE teachers (as well as their students). 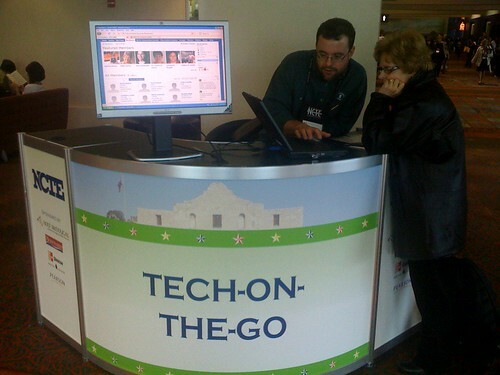 Then I was off to present at my Tech To Go kiosk for “RSS Feeds and Teaching English.” Again, more of the work of that session can be found on my wiki, so I want to reflect for a moment on the process of presenting that session (thanks to Bud Hunt for the photo). will be interested to see how the conference evaluations reflect people’s experiences with these Tech To Go sessions and to think about how we can shape them for next year. today! ), and offered me one of his CDs for helping. When we got to the room with time to spare, he asked if he could interview me for his YouTube channel. I encourage you to watch the video with Corbett Harrison instead! Then, was time for me to sit. Whew…. A session presented by Bill Bass, Melissa Lynn Pomerantz, and Debra Solomon Baker from St. Louis on “Extensions: Using Technology to Extend the English Classroom.” The three of them talked about how they used participatory tools in their classroom, including the use of audio recordings embedded in word docs to give students feedback, a variety of formats for discussion forums, and how to organize your personalized professional development with RSS feeds. It was good to hear Melissa and Debra in particular talk about how very simple uses of technology were having such a profound effect on their teaching. Anne Whitney’s Nittany Lions whipped on my Spartans, at least we were able to have a good conversation about how teachers learn digital literacies and we talked about how to continue supporting graduate students in the NWP network. Saturday night brought a trip down to the San Antonio Market District, and fun night of conversation with RCWP colleagues. ones was a panel of British scholars — Julie Blake, Tom Rank, and Tim Shortis — who talked about their work with digitizing texts in the British Library, teaching 21st century literacies to teachers, and understanding the role of txting in our language. All were thought provoking and helped me consider the many ways in which as the nature of literacy continues to change, the ways that we frame the discussions about the change matter as much — if not more — than the changes themselves. The idea that sticks with me most is that we, as educators, can help provide context, in a variety of ways, to the vast bits of knowledge that are out there. The project that the British Library is undertaking to organize and contextualize the texts in their collection is simply mind-blowing. Also, Kathy Yancey delivered another outstanding address that suggested we reframe the teaching of writing. I can’t even try to capture everything she said, but it was great stuff. to go to lunch, Allen Webb shared his new website, Lit Archives, and talked about a number of ways to engage students in classic literature by harnessing digital versions of those texts and inviting them into virtual worlds. After eating with my friend Carl Young, I had to catch a cab back to the airport. Finally able to get on wifi for free, I tried to write this blog post but (as you can imagine) ran out of time after checking email and talking with my Michigan colleagues who were about to hop on the plane with me. So, NWP/NCTE 2008 comes to a close with me writing the bulk of this post (novella?) on the plane heading home towards Detroit. Of all the things that I didn’t do, I feel bad that I didn’t keep up with Twitter via SMS all weekend, as Andrea worked very hard to get that as our networking tool for the weekend. And I missed a lot. A lot. I look forward to reading everyone else’s reflections. Yet, it was still a good conference. And the talk about technology and newer literacies filled most of the conference presentations and hallway conversations, implicitly or explicitly. I was able to help highlight the work of my colleagues and friends, some who were able to be at the conference and others who were not. For as much as I did, as many new people as I met and those who I became reacquainted with, I have to say that I am tired. Not looking forward to shoveling snow, although I am looking forward to seeing my kids, my friends, and my family over the holiday weekend. Happy Thanksgiving to all my students, friends, and colleagues reading this. Thanks for sticking through this post and sharing these reflections, as well as the entire conference, with me. See you next year in Philly, hopefully with a crew of teachers from our new writing project site. Well, we have a hybrid professional development experience coming up on September 24th for the Project WRITE teachers. In trying to meet a number of constraints and opportunities, I have set up a wiki page for the evening’s activities. Here is some of my thinking about why and how this is set up this way, as well as a screencast of my thinking, too. I would be very interested to hear your feedback about how (and if!) you think this will work. First, we had to have a way for participants who choose to go the hybrid route to both log their “seat time” for SB-CEUs as well as be connected to what’s going on. Originally, we had planned to use ANGEL through MSU, but for a variety of reasons, not the least of which we can not have enough guest accounts to invite all the Project WRITE teachers in, I didn’t figure that was the best idea. Second, even if we had enough accounts, I didn’t want to have to have people log in to something that they were not familiar with and try to navigate multiple tabs on a night that they would be using a new tool, Jing, anyway. Thus, I wanted an easy, open way for them to both “login” and monitor their seat time, while possibly having a back channel for communication AND being able to get the stream without having to have a separate tab or media player open. Third, and perhaps most important to me, I wanted to make sure that what ever we did was easy and accessible to the teachers, so they could replicate this process in their own classroom. After hearing about Meebo and UStream from many other edubloggers, and seeing that they could both embed in wikispaces quite easily, I figured that this would be the easiest way to go. So, I set up the Meebo chat room, the UStream channel, inserted them side-by-side in a table and, voila! So, this will be an interesting experiment in trying to figure out how to have a hybrid session, implementing digital writing tools while also teaching about digital writing tools. I am excited to see what comes of it, and look forward to any suggestions that you might have for me to streamline the process before we make a go of it here in about two weeks. Today marked the end of our Project WRITE summer institute, and there were both smiles and tears to be found amongst the many of us who shared our writing this morning and our professional learning this afternoon. My partner, project leader Liz Webb, structured an amazing week, given all that we had to do from evaluating student work to preparing a lesson or series of lessons for the school year and sharing a piece of personal writing. Each morning began with one of her writing starts, and the teachers are working together to produce a book through lulu.com. Then, we would spend some time evaluating student work with the NWP’s analytic writing continuum, and have time for professional reading groups. Finally, I would introduce a short tech topic each afternoon (digital storytelling, Zotero, and SlideShare, respectively) and teachers had the option to continue working on the new technology, or work on their own curriculum plan. Continuing to differentiate between a blog and a wiki, as well as the purposes for them. Some teachers were finally able to really absorb Edublogs, digging into the overall design of their site, working with widgets, and figuring out categories for organization. Others wanted to stick with wikis, which worked out well, too, to talk about the overall design and organization of a site. In each case, we talked about purpose and audience, considering who would be doing the most posting, commenting, and reading, and making decisions from there. Digital storytelling catches like wildfire. Always. I introduced it on Monday, beleiving that it might be the straw that broke the camel’s back. Instead, a number of teachers took to it. This raised (and continues to raise) a series of questions for us about fair use, copyright law, Creative Commons, and how to invite students to build on, cite, and ethically use the work of others. We discussed how some uses may be fair within your classroom walls, but how posting to YouTube made it a whole different game. Suddenly, many teachers this week became hyper aware of this, and I think that it will be an interesting thread that continues into our fall PD. Finally, having time, time, time. We were supposed to have this week of intro last summer. For a variety of reasons, we didn’t. And, while I don’t regret the work that we have done or the many successes that we have had, I do wonder what we might have been able to accomplish over the school year if we had been able to kick off last summer with an entire week of work like this. Ah… a lesson for a future PD experience. All in all, we enjoyed our time together, minus the extreme heat in Brody Hall. I think that a number of the teacher grew in leaps and bounds, and we all grew in some way or another. I was very impressed with the transparency of technology today in our final read around, where a digital recorder was passed from person to person, pages were brought up on the wiki, and images were shown to complement the work being read. And, we hardly had a hiccup. For the first time in four years, I will not be going to an NWP tech/writing style workshop, and I have to admit that I am a little bit bummed. Both Tech Matters and the Technology and Writing retreat have been good sources of inspiration and collegiality over the past few summers, and I hope to capture some of those feelings in two workshops that we are planning for RCWP here in August. The first week, August 4th, we are engaging 40 teachers from Project WRITE in an immerse, inquiry-driven study of adolescent literacy and technology. Much like Bud’s CyberCamp, we are planning to structure this workshop for teachers to make maximum use of the time, access to computers, and collegial support. For the portion of each day that I am planning, I intend to make the first hour a work/collaboration time, with the explicit goal that teachers will produce anything from one lesson to a whole unit, somehow using read/write web technology, by the end of the week. On Thursday, they will share their work with a group of cross-grade, cross-school colleagues to get feedback. During the other half of each afternoon, I am taking a move from Tech Matters and creating “birds of a feather” groups. Want to brush up on blogs? Go to this room with this teacher leader. Want to find out about photo sharing, which we haven’t discussed yet as a group, but you want to learn something new? Come to this room with this other teacher leader. And so on. Or, keep working on your unit. Throughout the week, I hope to offer anywhere from 3-6 different experiences for people to sample from, all leading to the presentation of their final lessons. This will be one of the last major pushes with Project WRITE. In September, we will do one of our sessions completely online. Then, we have two full day sessions on Saturdays — one in October, one in November. I am looking forward to seeing what people pull together for our August session, and to seeing what unfolds for them in the year to come as they more fully integrate technology into their teaching of adolescent literacy. For the second week, August, 11, we are putting on our own version of Tech Matters for the RCWP leadership team. This will involve myself as a lead facilitator, four additional RCWP teacher leaders as facilitators and presenters of their own classroom case studies, and then a number of participants from the RCWP leadership team. Again, the goal is to collaborate and offer people time and space to work, this time focusing more on the work of our writing project site. Each of the case studies will provide us with a situated look at how one teacher employs technology in his/her classroom, and that will open up conversations for the leadership team about how and why we might employ similar technologies at our site for the summer institute, professional development, continuity programs, and youth programs. Then, in the afternoon, we will have lots of playtime, where we too can do birds of a feather groupings, allow people time to play with tools introduced in the morning, and continue conversations about the future of our site’s work with technology. In some sense, this is kind of the culminating moment of our work with NWP’s technology initiative, as we are now trying to distribute the knowledge of a few key teacher leaders at our site into the larger leadership team and day-to-day work of the site. I just wanted to capture my initial thinking on these two workshops as we finalize the SB-CEU applications and get ready to move through the month of July in a haze of firework smoke, BBQs, and long, warm summer afternoons. It is good to be thinking ahead to these events and all the great work that teachers will be engaging in this year as a result of them. Please leave comments here so we can continue the conversation. Yesterday, our RCWP Project WRITE team had the good fortune of being able to work with NWP’s Director of Research and Evaluation, Paul LeMahieu, on an analytic writing continuum workshop. In his talk, which was similar to the session that I attended last summer, he talked about how the continuum has been developed, the pedagogical uses of it, and how we, as professionals who teach writing, need to not just tell those who value tests to “stop,” but to also offer them something better to use instead (we hope to post some notes on the session soon on the Project WRITE wiki). So, it will be interesting to see how this turns out. Students, in groups, will be assessing the other groups’ work and I will be throwing in my grade with the whole bunch to get an average. I haven’t graded anything multimodal yet, let alone a collaborative grading where students are involved in the process. I’ll write more about it once we are done, and look forward to hearing your ideas about how you are teaching and assessing multimodal writing, as well as any resources that you can point to about this messy, yet engaging, component of the writing process.